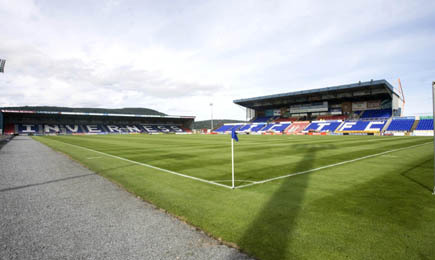 A lacklustre Motherwell turned in a poor display and were soundly beaten by Inverness CT in the Highlands today. After an encouraging and welcome win over Dundee United, hopes were that ‘Well would be able to build, but in truth, Kenny Black’s side failed to get out of first gear for the whole ninety minutes. The home side had taken the lead in the 29th minute when Billy McKay ran clear of the Motherwell defence, but the managerless Steelmen levelled just two minutes later through Henrik Ojamaa. But Caley Thistle displayed more of the qualities that see them share top spot in the second half as they went back ahead through Marley Watkins close-range header on 70 minutes before Josh Meekings secured the points eight minutes later as he slid in to meet a corner-kick at the back post. Black named an unchanged side from the one which defeated Dundee United 1-0 in their last outing, while Caley boss John Hughes welcomed back impressive youngster Ryan Christie into his starting eleven. The early stages of the match were fairly uneventful, with Caley seeing most of the ball but with side creating anything of note until the 24th minute when Greg Tansey’s 30-yard free-kick sailed just wide of the post. But five minutes later Billy McKay put the home side ahead after being sent clear on the right by Ryan Christie and he finished coolly beyond Dan Twardzik in the Motherwell goal. That sparked the game into life – and just two minutes after going ahead, Caley were pegged back to level terms by Ojamaa after the Estonian got on the end of a John Sutton cutback before keeping his composure to blast the ball beyond Dean Brill. It perhaps wasn’t merited, but the visitors would very much take it. Ryan Christie almost put Caley back ahead with half-time beckoning, but he was denied by a tremendous Twardzik save to keep the scores level. Inverness began the second half well and should have retaken the lead inside two minutes of the restart as the usually deadly McKay again broke clear before rounding Twardzik, but his shot, albeit from an angle, was high over the goal. The Northern Irishman wasted yet another chance when he lofted a ball over the bar from just inside the area after escaping the attentions of Craig Reid. The home side kept plugging away however, and they were rewarded with 20 minutes left when Graeme Shinnie sent a ball into the box and it was headed home from close-range by Marley Watkins. And on 78 minutes, the points were secured as Josh Meekings got himself on the end of a Tansey corner at the back post to make the game safe. There should have been even more for the vast majority of the 3,037 crowd to cheer as Watkins hit the bar from just six yards out after Caley broke at pace and substitute Aaron Doran played him in. However, the final whistle signalled a thoroughly merited victory for the home side against a Steelmen side who frustratingly failed to cause the home defence any problems at all. 31mins: Unbelievable! Ojamaa hammers home Sutton’s cutback to make it 1-1 with our first venture into the ICT box #ICTFCvMFC! 21mins: ICT turning the screw. Only a last-ditch interception from Kerr prevented Watkins a clear scoring opportunity then seconds later..
“I don’t think the team gave enough in the 90 minutes and 3-1 flattered us. “It could have been more and as much as I enjoyed the game against Dundee United a fortnight ago it was the total opposite today. “It wasn’t good enough – simple as that. I didn’t think we caused Inverness any problems at all and at times it was like some of our players had never seen a ball before. “The better team won on the day. I thought they were far better, far brighter and they passed the ball better than we did. “You are looking to try to cause them problems, and our only attack in the first half resulted in the goal – and it was probably the only time we strung three or four passes together. “We knew that coming off a win the other week they would be galvanised and they would have that siege mentality. “In the first half it was a wee bit sticky and it took us a while to break the game down. Kenny Black expects another tough test as ‘Well once again go toe-to-toe with SPFL Premiership high-fliers. Two weeks ago, the caretaker boss, who five days previous picked up the reigns from the departed Stuart McCall, locked horns with then top-of-the-table Dundee United, running out 1-0 winners thanks to Iain Vigurs’ goal. The job doesn’t get any easier for Black, with joint leaders Inverness CT next up on their own patch. But whilst the former Steelmen midfielder concedes his side has a tough match ahead against a team who haven’t lost at home all season, he insists the squad travel north with optimism after that excellent result against the Terrors. Speak to the broadcast press at Motherwell’s pre-match news conference, the 50-year old said: “Going up to Inverness is never easy at the best of times, they’re playing with a lot of confidence and consistency, which makes the job really tough. “They’ve benefited from Big Yogi (John Hughes) having a summer with them and you can see them starting to reap the rewards from that. “They’ve also managed to keep virtually the same starting eleven for most games this season, that has helped them win games which breeds confidence. Black is also hopeful the players will respond to a slightly calmer week that the turbulent few days leading to the match against United. “The week leading up to the Dundee United game was a difficult one for us all,” he admitted. “We have had a couple of weeks now to digest that and we know exactly what is required now. “The commitment was what I was happy with against Dundee United. They are totally focused. They realise they have to continue put in these performances. Skipper Keith Lasley is adamant events off the field will have no negative effect on the team. Former boss Stuart McCall resigned prior to the Dundee United match after almost four years at the helm at Fir Park. The club announced at the start of this week that it has been agreed to delay the appointment of a new manager until the issue of ongoing ownership of the club is resolved and that Kenny Black would continue on as Caretaker. That gave some clarity to all concerned and although the new appointment is not far off, experienced Captain Lasley insists it won’t impact at all and the players remain firmly behind Black on the quest for more victories. “As players we can’t control anything behind the scenes; a takeover and the management situation,” he told the press at Motherwell’s weekly news conference. “There is a little bit of uncertainty around the club, but we will try to provide a bit of certainty on the park at least to try to get as many good results until things are resolved. “Initially the week Stuart left was a difficult week, it was an unexpected turn of events. “We made a point of speaking as players and saying that it’s football – bad people come and go for different reasons, but good people come and go as well.